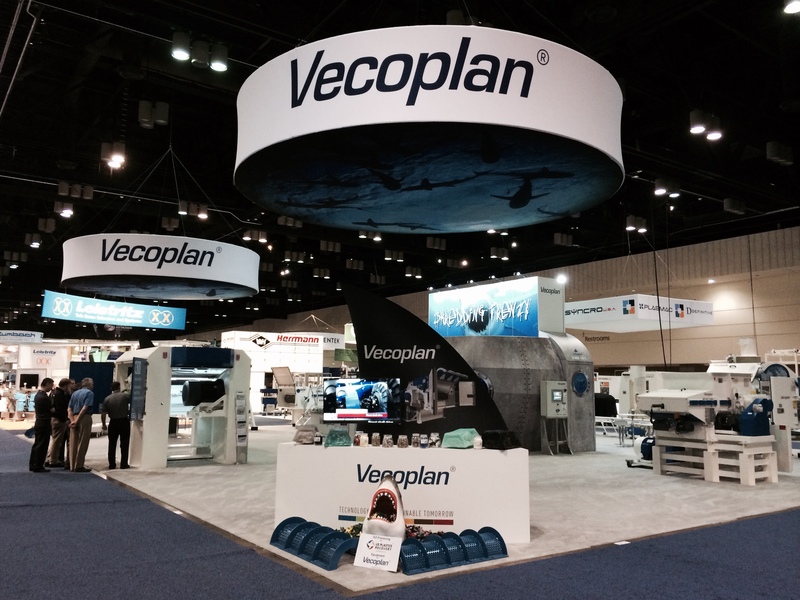 June 10, 2015 - "Press Releases"
ARCHDALE, NORTH CAROLINA – June 10, 2015 -----Vecoplan’s NPE 2015 ‘Shredding Frenzy’ booth was recently honored with a platinum Hermes Creative Award. The Hermes Creative Awards were established over three decades ago to honor the messengers and creators of traditional and developing media. Receiving this award is a tremendous achievement that recognizes outstanding talent within the marketing and communication industries. The booth was entered into the competition by Vecoplan’s exhibit and manufacturing company, Apple Rock Advertising and Promotions, Inc. The highest achievement from Hermes, the Platinum Award was won in the category of advertising and trade show exhibits for the custom design and build of a display. The ‘Shredding Frenzy’ exhibit featured a shark tank meeting room, fully loaded interactive technology space and a hanging sign that used lights and computer images to project sharks. Only 15 percent of entries won the coveted Platinum award, in which both companies are proud to be a part of. Hermes Creative Awards is an international competition for creative professionals involved in the conceptualization, writing and design of marketing materials or programs. There were over 6,000 entries in 2015, from 22 different countries around the world that competed in 195 different categories. Those categories ranged from advertising to integrated marketing, public relations, electronic media and trade show exhibitions as well as everything in between. These awards are overseen and judged by the Association of Marketing and Communication Professionals. 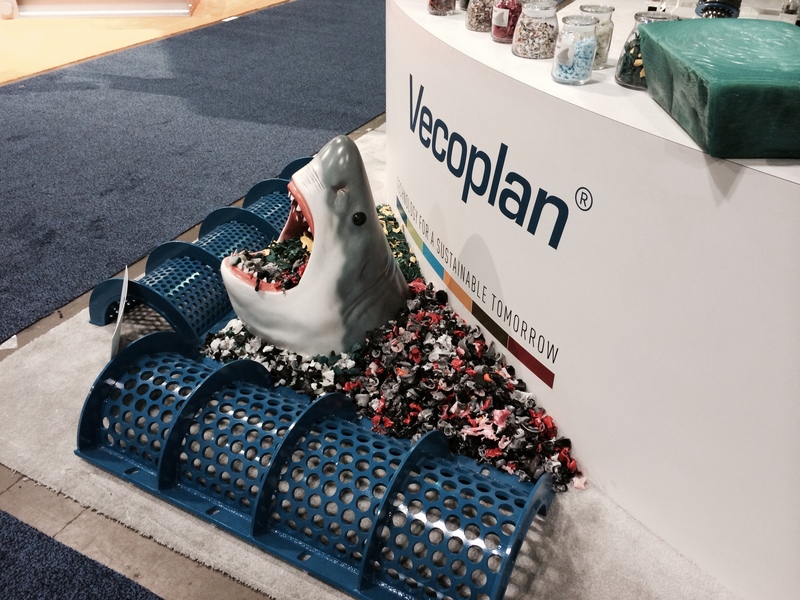 Vecoplan is the global leader in technologically advanced machinery and systems for shredding and recycling. We design, engineer, manufacture, install, and provide start-up training on, as well as ongoing parts and service for individual machines and complete systems used to shred plastics, wood, paper, tires, medical waste, and broad range of other materials. Vecoplan is also a leader in mechanical technologies for processing Biomass, MSW and other wastes into biofuel and bioenergy feedstock. Capabilities include unloading of raw feed-stocks, pre-shredding, ferrous separation, conveying, screening, air classification, re-shredding, non-ferrous separation, optical separation, testing stations, storage, and metered feeding to the boiler, to the pelletizing machinery, to the liquid fuel conversion system, or to other waste conversion technologies.